Your grandmother was right about a lot of things. Yes, you should wash your hands before eating. Yes, you should get out of those wet clothes right away after sledding. Yes, you should take the book you’re reading outside to enjoy the fresh air and sunshine. And yes, you should eat more barley. 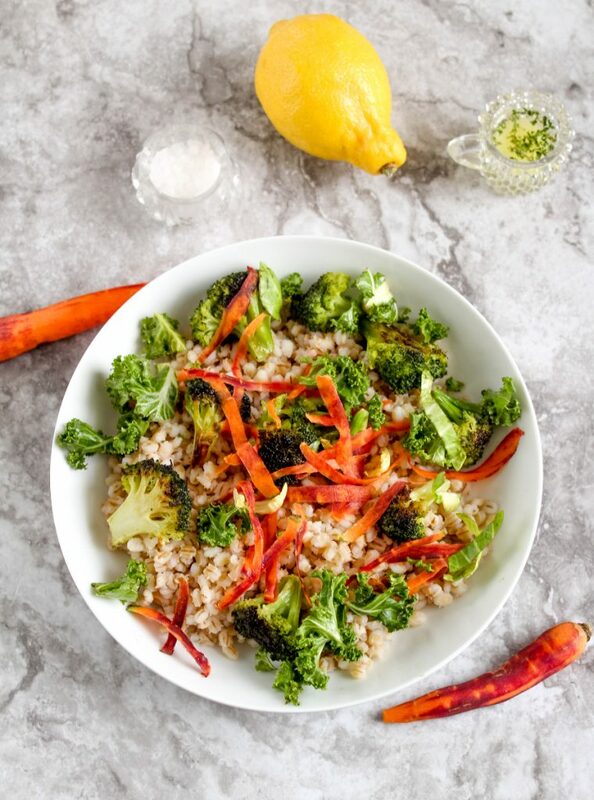 Barley is loaded with health benefits — not to mention the fact that it’s delicious and nutty, and it pairs beautifully with practically anything savory. But let’s get back to those health benefits. One of the best things about barley is that it’s packed with soluble fiber. Soluble fiber helps slow the absorption of carbohydrates into the body — thus keeping blood sugar from spiking after a meal. Barley also has a low glycemic index, which — like soluble fiber — means it can help to control and regulate blood sugar. The lower the glycemic index, the better for diabetes. Also, did we mention that barley is delicious? And finally, let’s not forget about the magnesium that barley brings to the table. Magnesium encourages the healthy production of insulin, which is a major help to diabetics. This salad isn’t just full of health benefits though. It’s bright and lemony, and works as well for a Wednesday lunch as it does a weekend dinner party. Three cheers for grandmothers and their impeccable advice. In a medium saucepan, heat 2 teaspoons of the olive oil over medium heat. Add the barley, and toast for 2 minutes, stirring frequently. Add water and ¼ teaspoon salt to the pan, and bring to a boil. Cover the pan, and simmer for 25-30 minutes, or until cooked through. Pour the barley into a colander, and run under cold water. When barley is completely cool, reserve. Rinse the broccoli under warm water, until partially thawed. Pat dry with paper towels. Toss broccoli with remaining olive oil, and season with remaining salt and pepper. Place the broccoli in a single layer on a large, rimmed baking sheet. Roast for 20-25 minutes or until browned. In a small bowl, toss the kale with the lemon juice. Massage by hand, until kale is softened and has reduced by half. 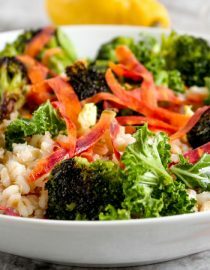 Place broccoli in a large bowl, and toss with barley, kale and carrots. Combine all of the ingredients in a small bowl, and whisk well. Gently toss the salad with the lemon dressing and serve. It can be hard to keep on the straight and narrow as a diabetic. Here are some delicious recipes for diabetics that can help change your eating habits. What Are Diabetic Socks and How Can They Help? How Does Type 1 Diabetes Affect Your Mental Health? We are building our Diabetes community.